These can be found on the 11th page of Jam Mart Clothing. They are for members only but come in a nice orange that really goes with the season (and Halloween)! 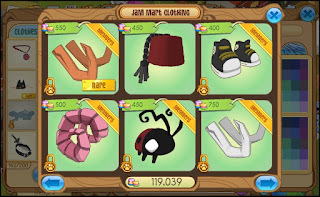 There are a few other new Halloween items in the clothing and den stores around Jamaa, though I didn't take any screen caps of them. Make sure you check the store yourself so you know what is still rare and what can now be purchased!